People who suffer catatonic depression usually have typical catatonic depression symptoms, such as: unusual movements, inability to consume foods and drinks, and immobility. They may have difficulty completing simple tasks, such as sitting up in the bed, or leaving the bed. But they may also have difficulty changing their clothes or even going to the toilet. Catatonic depression symptoms make it difficult to have a normal conversation for them and for you. 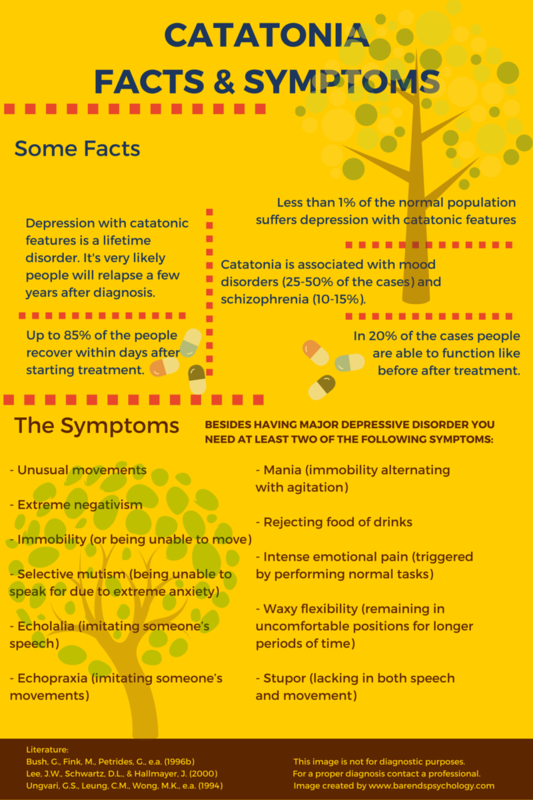 On this page you find everything you need to know about catatonic depression symptoms, causes, and treatment. Less than 1% of the normal population suffers depression with catatonic features. This disorder is associated with mood disorders (25 to 50% of the cases) and schizophrenia (10 to 15% of the cases). This is a lifetime disorder, because it’s very likely that people will relapse after a few years of diagnosis. In 20% of the cases, after treatment, people with catatonic depression are able to function like before. However, it is common that people will not recover completely. At Barends Psychology Practice depression is treated. Schedule a first, free of charge, session now. Go to contact us. (Depending on your health insurance, treatment may be reimbursed). What is this for kind of depression? How does someone get catatonia? In the past, catatonia used to be a specific mental disorder, but nowadays this is not the case. 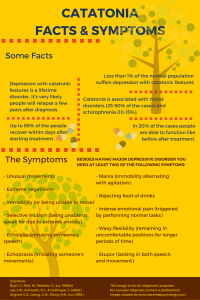 Someone with catatonic depression suffers from the symptoms of major depressive disorder with catatonic features. A catatonic feature could be impairment. Suffering from catatonic impairment means that you have trouble controlling voluntary movements. People diagnosed with depression with catatonic features may have difficulty completing simple tasks, such as sitting up in bed, or leaving the bed. Performing daily tasks can be very challenging for them, if not impossible. Having a normal day to day conversation may be very difficult as well. Catatonic depression symptoms are usually associated with Bipolar disorder, because some symptoms of catatonic depression are common during a Manic episode and others are common during a depressive episode. Bipolar disorder is characterized by both manic and depressive episodes. This disorder is also associated with PTSD, schizophrenia, and of course depression. As mentioned before, less than 1% of the normal population suffers from depression with catatonic features (only 5 to 9% of the psychiatric population suffers this disorder and only 10% of the normal population suffers a psychiatric disorder: 5 to 9% of 10% is less than 1%). immobility (or: being unable to move). selective mutism (or: being unable to speak for due to extreme anxiety). mania: immobility alternating with agitation. inability to consume food or drinks. intense emotional pain triggered by performing normal tasks. waxy flexibility (remaining in uncomfortable positions for longer periods of time). stupor: lacking in both speech and movement. In order to meet the criteria for catatonic depression a person must experience at least 2 of the catatonic depression symptoms mentioned above and must have a major depression. Although the exact cause is unknown, experts believe that an imbalance of neurotransmitters (dopamine, GABA and glutamate) in the brain may at least partially cause this type of depression. An imbalance of neurotransmitters in the brain usually affects behaviour. Other experts say it might be the result of an excessive fear response. When there is danger people respond in 3 ways: they Fight, Flee or Freeze. Catatonia is associated with an excessive Freeze response. As a result of this Freeze response all emotions and movements are switched off or temporarily frozen. In nature you see this response a lot in animals and insects. If you approach a spider its first response is to sit still hoping you won’t notice it. There are two ways to treat catatonic depression. Benzodiazepines (Benzo”s): Benzo’s are the first choice of treatment for this type of depression. Benzo’s increase the effects of the neurotransmitter GABA. By finding a balance with the benzo’s, the patient has a very good chance of recovery! The catatonic depression symptoms reduce and make the person able to function again. Approximately 80% of the patients using Lorazepam recover within a few days after starting the therapy. * Note: It’s unclear how quick patients would recover without medication. It may be that the effectiveness of Lorazepam is slightly lower. Electroconvulsive therapy (ECT): Effective in 85% of the patients, it is considered the most effective treatment for catatonic depression. Read more about ECT. Bush, G., Fink, M., Petrides, G., e.a. (1996b). Catatonia. II. Treatment with lorazepam and electro-convulsive therapy. Acta Psychiatrica Scandinavica, 93, 137-143. Lee, J.W., Schwartz, D.L., & Hallmayer, J. (2000). Catatonia in a psychiatric intensive care facility: incidence and response to benzodiazepines. Annals of Clinical Psychiatry, 12, 89-96. Ungvari, G.S., Leung, C.M., Wong, M.K., e.a. (1994). Benzodiazepines in the treatment of catatonic syndrome. Acta Psychiatrica Scandinavica, 89, 285-288.